In wake of the recent Flashback botnet which plagued more than 600,000 computers running on Apple’s Mac OS X and the security ‘brouhaha’ that ensued later on, Apple has removed a statement on its website that earlier said that Mac OS X isn’t susceptible to viruses. 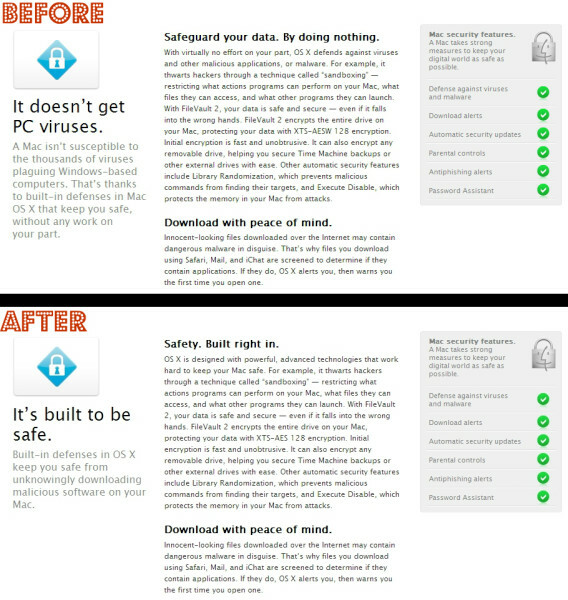 Apple removed the previous statement “It doesn’t get PC viruses” and replaced it with “It’s built to be safe“. Apple seems to be eating its own words and trashing the widely accepted notion that its operating system for desktops and laptops, Mac OS X, cannot be invaded by viruses/malware. The Flashback botnet and the Kaspersky evaluation can be considered as unexpected alarms to wake Apple from its peaceful sleep, as it thought it to be after the success stories of the iPod, iPhone and iPad. Apple has always been praised for its creativity, design and consumer friendly properties but Security is definitely an area where Apple has a lot of catching up to do. And replacing the earlier messages on its website with new ones is a sign of Apple starting to take security concerns seriously, according to Sophos US senior technology consultant Graham Cluley. I view the changes in the messages pushed out by their marketing department as some important baby-steps. Let’s hope more Apple Mac owners are also learning to take important security steps–such as installing anti-virus protection. Apple has also released a security guide for the iPhone operating system iOS which can be accessed from here. February 2012 marked an announcement from Apple that OS X 10.8, or Mountain Lion, would include a new feature called Gatekeeper that would restrict which applications users can install on their devices. A success cake isn’t always complete. Apple must have learnt by now. LOL Apple gets busted… nice work, Syed. Unfortunately, nobody is exempt from these stupid, unnecessary viruses. I still think that the authors only do this to help fuel a multi-billion dollar anti-virus/anti-malware protection industry. I would bet that Norton and McAfee created the first PC viruses back for MS-DOS back in the 1980s. I have been telling Mac users for years that they were not unsusceptible to viruses, malware and such but all they would do is laugh at me …… we guess what ? NOW I am laughing at YOU! LMAO!